As Scouts, we all know the importance of spending more time outdoors and getting involved in our communities. 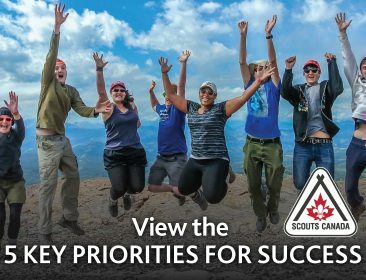 The 1st Nanaimo Scout Group puts these principles into practice every week and it’s no wonder why their Group has grown by 150% this past year! ScoutScene decided to take a moment to chat with Group Commissioner, Stacy Desjardines to learn more about their Group and their growth secrets. For the 1st Nanaimo Scout Group it’s all about Youth-led programming. Whether their out in the community, learning how to make a fire or winter camping, the youth have a say in their program activities (a big thanks to the Canadian Path!). “We try to free the barriers as much as we can to help the youth participate in as many activities as they would like. For us, it’s all about the kids and their experience in Scouting. It’s important for them to try new things, to get outside, to build long-term friendships and connections they might not have otherwise made”. Stacy was also proud to let us know that you can easily find her Group out and about in their local community. The Group participates in various events like Apple Day, Scout Guide week and their local Remembrance service. This year alone they gained 6 new youth members by simple participating in Remembrance Day. Not only do we try to get out in the community as much as we can, but the youth talk about Scouting all the time with their friends! This year the 1st Nanaimo Scout Group will be trying something new – participate in Hands Across the Border 2016 in June – an event which celebrates the existing peace between the United States and Canada. Luckily for them, they will have the opportunity to cut the ribbon for Canada. We look forward to checking back in with the 1st Nanaimo Scout Group soon, as we anticipate their numbers will continue to grow.